Okay this is very off topic but my recent trip to Canada with my young family taught me something. I never thought about it before but travelling with a baby (mine being one year old) is a bit tricky. In fact it seems like she has more luggage than me! Anyway lets get to the real issue and that is car seats. If you are travelling with a child and you have booked a seat it seems that many airlines require you to have a car seat…. aha this is where it gets tricky because very few will let you know what is acceptable. Add to that the fact that north american airlines have different rules and you have some issues! 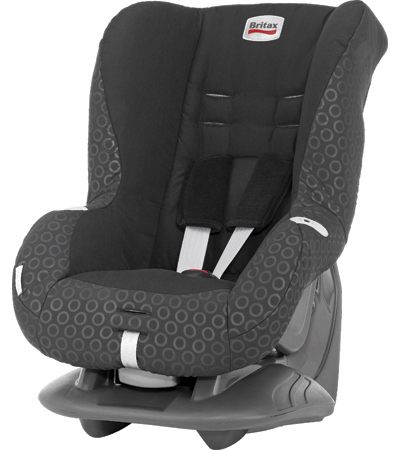 North America and Europe have different standards so its important you know what type of car seat to bring…. Check-in at BMI desk, a staff member called a supervisor to check our car seat. We were told it needed to be a five point harness and be able to secured with a lap belt. The hostess on the BMI domestic flight came and checked we knew how to install it and to ensure it was secure. Connecting in Heathrow was a nightmare try carrying a large car seat at speed through Heathrow (come to think of it try going at speed through Heathrow normally!). On the Air Canada flight an air hostess asked to see a red sticker, apparently North American car seats have some kind of sticker indicating compliance with a sticker. This being a UK one it has an orange sticker saying it complies with ECE R44/04 certification. I did say that this seat complied with Air Canada’s own rules (as stated by their sales team) we had enough trouble just getting them to tell us this… anyway we were allowed on after her supervisor (I think) looked at it and checked how it was secured. The BMI flight a member staff (ground crew)took our car seat and said they would get someone to install it for us, which was very nice until we got to our seat and they had left the strap that secured it twisted and very loose! (Make sure it is tight as turbulence might be an issue!). When we started to put our daughter in the seat the Air attendant said that he thought we should have her on our lap during take off and landing…. argh! Fortunately he said he would check and then never returned. One more thing: I bought a device to drag our car seat around airports I can’t say how much this saved my back! It seems to fit most car seats (including our Britax Eclipse), this is it, I purchased it in Canada (at BabyDepot in Kitchener, Ontario http://www.thebabydepot.ca/) as I haven’t found it in the UK (anyone any ideas??). It’s called the GoGo Kidz Travelmate. Only thing I would say about it is that we had to take it off to fit through airport scanners and it has the worlds longest screw on it when people are tsk tsk ing behind you…. For your forthcoming flight with your daughter, you will require a car seat. 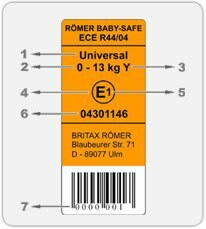 The car seat must ensure that item displays an ECE R44/04 certificate label which indicates that it complies with Standards Safety Regulations and requirements. From April 2008, all child car seats that were manufactured before 1995 and approved to ECE R Standard Regulations 44/01 and 44/02 are no longer legal and must not be used. You may not use a booster seat or cushion as it is not desgined for aircraft use. I trust this is the information you require, and should you have any further queries, please do not hesitate to contact me. The CAA accept a child seat that is approved to the European Standard and suitable for use with a lap belt. However, as the ultimate responsibility for using the seat on the aircraft lies with the airline, we always recommend that you contact them for confirmation and check that the seat in question will fit (dimensionally) on their airline seat. We have had positive feedback from users concerning use of the Freeway, Prince (or Fisher Price Forward facing Child Seat) on BA flights. Although the Eclipse and Renaissance technically comply with the above rules we have not had similar feedback from customers concerning these models. Please note that FAA airlines are likely to have different regulations. In regards to regulations this is a legal requirement that we have to comply to and not a general decision, there is no worldwide regulation. We do hope that this is of assistance to you. Hi, just read your blog – I've just bought a gogokidz travelmate (direct from very helpful US manufacturer) and am looking for a seat to fit – just been looking at the Britax Eclipse so cheered to see you say it fits the travelmate! I assume you took the seat on the plane and it fitted fine. I am told by easyjet that the seat must not be wider than 42cm, the Eclipse above is stated as 43cm wide but I assume you had no problem fitting your seat in the plane, assuming that 43cm is the maximum width and that the base is narrower, and presumably you can play around with the arm rest on the side nearest you! Any advice would be really helpful! Thanks. The travelmate and eclipse do fit together, I used the generic car seat instructions rather than the Britax specific ones (if you bought the same one as us, as I think we bought an older model…). One thing I would say is that the screws to fix the seat to the travelmate are long and when you are at the front of a queue take forever to come off (practice before going on your holidays!). Some security staff also required that they come apart to fit through the airport scanner… not that the seat fits through all the scanners, but they do have a handheld device for these larger items. As to airline seats, I've not flown EasyJet so can't say for sure. As my blog post says airline staff were not consistent. I've not got the car seat in front of me but I would say that 43 refers to the max width, the base is indeed smaller than the max width… The arm rest did have to be put up. Our BMI was a smaller flight and it worked fine. What we really like about the eclipse was that you could recline the seat very easily (good for longish plane journeys). Thanks for taking the time to put this information on the net. I’m struggling to find facts on this topic but this post was useful and encouraging. The number after the E just refers to the country of manufacture – E1 is Germany, E2 is France, E3 is Italy, E4 is the Netherlands .. Thank you for this post, it was the final confirmation that I needed to buy the Eclipse car seat for our upcoming flight with Cathay Pacific. They did confirm already that it would be allowed. I have one question however that I can’t seem to find an answer too. Does it fit with the airplane seat belt as is, or does it need a seatbelt clip to shorten the belt? We did not need anything extra, the airline belts have always seemed to fit. Enjoy your flight! please can someone help me and tell me which brands of carseat will fit on an easyjet plane as they will only us take a carseat if it is no larger than 42cm wide. I have looked everywhere please help me. I did a bit of research on this for you (this post is quite old, my kids no longer need car seats on planes!). The guidance you refer to for easy jet is located here http://www.easyjet.com/common/img/EN_FAMILY_TRAVEL_QA.pdf.